I know I’ve mentioned wine awards before. Forgive me for bringing this up once more. Though, word has it that, yet again, a Maltese wine has been granted another two noteworthy medals. Awards may not matter that much anymore. But, you see, it was not all that long ago that loving local wasn’t that cool. Maltese people were, in that sense, quite different from the wine-appreciating neighbouring nations, unconditionally proud of their own vinous heritage, whereas we in Malta, needed a little more proof. But look around now. The propensity for all things local is here. It has arrived, regardless of accolades perhaps, but for the reason that the quality is there for all to taste. It is no longer a question of blind faith but palatable fact. A wave of imported bottles may have swept across the Maltese Islands wooing the inexperienced drinker. But since then, Maltese wine has transformed itself and doubting Thomases that care to try will get convinced of what wine critics abroad have known for a while: it’s poised on the brink of success. 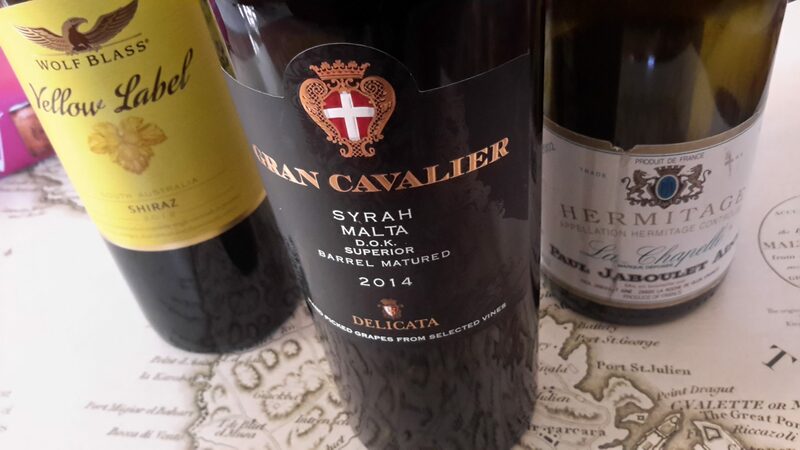 Previously, I have also written about Maltese Syrah and I have praised in particular Delicata’s Gran Cavalier label. Now, here’s the outstanding 2016 vintage of this great red. The result is official: the wine landed a silver medal at the Syrah du Monde, a single-class competition organised in France’s Rhône valley, the heartland of the Syrah grape variety. It also won a second medal, namely a bronze at the 2018 International Wine Challenge in London. Well, believe it or not, but experts at the Syrah du Monde contest this year rated Delicata’s Gran Cavalier Syrah on a par with wines from the renowned French appellations of Saint-Joseph, Crozes-Hermitage, Hermitage and Côte-Rôtie, where the grape is known to shine. It also beat some heavy hitters exported by the big names from Australia’s top regions McLaren Vale, Barossa and Hunter Valley. If you aren’t all that au fait, you could google these place names in conjunction with the word Syrah, or Shiraz as the grape is called Down Under, to get an idea of the significance of the achievement. But, better still, share in the thrill of tasting this ultra-local wine yourself. Taste it without preconception, possibly comparatively alongside some of the foreign medal winners and you will experience its greatness. To anyone coming nose-to-nose with the latest release of Matthew Delicata’s flagship red, the world-class quality of this Malta-grown Syrah is in plain sight, especially when heaps of character jump right at you. Take a bow, Matthew Delicata. He is the fourth-generation winemaker who always pours his heart into this wine. Chic, plush and layered, with aromatic cassis fruit and an abundance of elegance, this 2016 vintage equals, if not surpasses, the finest of previous years. This premium wine has received the VIP treatment: hand-picked, quality fruit from selected vines planted to tal-Ħamri soils, a strict maceration regime along with 11 months judicious barrel maturation in purposely procured American, but predominantly French, oak barriques. This complex, Maltese red smells of leather, old spice and smoke but it’s never heady. Weighing in at 13 percent alcohol, this superior wine seems somewhat delicate in nature. The palate possesses a depth of mouth-filling raspberry and blackcurrant, fruit no other grape can touch. The juice is glossy; the tannins are supple, not stern; and in the end you’re left with a smacking good-bye kiss. Already approachable now, the 2016 Gran Cavalier Syrah doesn’t really need any extra cellaring, but will age grace-fully – that is if you can resist to uncork it anytime soon. This article by Georges Meekers first appeared in Times of Malta on 29 June 2018. Wine lists by soil type, seriously? Get the wine-soaked quarterly newsletter. Let's talk wine! Articles, handy tips, reflections, and more from Georges Meekers, delivered about quarterly to your inbox. For free. © 2019 Wine Campus All Rights Reserved.